Drying ovens are used in various research laboratories and industries for curing or drying the components, as well as several complex applications. The drying process helps improve the shelf life of various products. These ovens operate in ambient temperatures and are designed for batch processing or continuous drying. We, at Armature Coil Equipment Company (ACE), design and build high-performance industrial drying ovens in various specifications, such as multiple oven sizes, temperature capabilities, as well as processing requirements. Our advanced manufacturing capabilities enable us to exceed client’s specific requirements for their industrial production and laboratory applications. Why to Choose ACE Industrial Drying Ovens? These drying or heating ovens are well-known for their highly efficient thermal designs, which help speed up drying times. Constructed from heavy gauge stainless steel and ensuring low surrounding air temperature, the oven provides superior drying results due to uniform heating. The temperature of ACE industrial drying oven is controlled by a nanotechnology based microprocessor controller, which helps the clients achieve various complex drying requirements efficiently. Stainless steel construction helps reduce corrosion and ensures lasting performance. This property also helps reduce sample contamination. Batch ovens are suited for drying a variety of components for industrial, clinical, and research needs such as timber, ceramics, powders, sands and soils, pharmaceuticals, etc. Our drying ovens provide fast heat cleaning of various durable materials, such as stainless steel, aluminum, coated parts, etc. All standard and custom rotary drying ovens are pre-assembled, tested, and certified before shipping. This helps us stay true to our quality commitment. The oven is equipped with hinged access doors, which provides access to the length of the equipment, thereby making it easy to clean it. 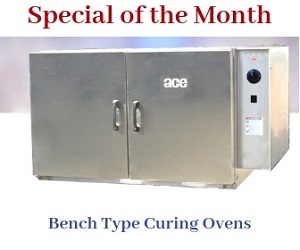 Over the years, ACE has gained popularity as a leading customized drying oven manufacturer. Our experienced manufacturing experts will work with you to determine ideal airflow arrangement, as well as equipment configuration to meet your drying application.